…which is why we’ve come up with 5 core ingredients for any cleaning. If you can get these 5 aspects understood and ticked-off, then well done! You’ve nailed it. 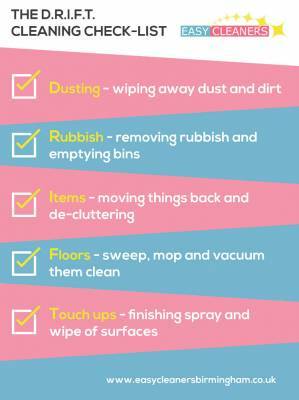 After reading this handy list, cleaning whatever you or others need to do in your home or business will now seem clearer and more achievable. D – Dusting. Dreaded dust will settle everywhere, in most cases very obviously if you look closely enough. Look out for high-up places like light fittings and corners and use a feather duster to whizz around. For lower areas like tables, surfaces, and top of skirting boards, you can use a cloth or duster to wipe off (remember that it’s best to first remove this dust before going back for the final dry- or wet-wipes, as below). R – Rubbish. Wherever it is, remove it! Put it all in nearby bins and bin-bags, and remember to then clear out all bins and baskets into any outside bin or service for collection. I – Items. Check all the loose items around, whether furniture, or items like ornaments and other personal items. Get them all nice and tidy, move them around or store away if appropriate, and generally make sure the place is de-cluttered. F – Floors. These are too easily spotted as people’s eyes look down, so whether it’s sweeping, mopping, or hoovering, get them nice and clean. T - Touch-ups. That finishing touch will make all the difference, for example a cloth with spray on a surface, or some nice smelly fragrance in the air. We also have these DRIFT principles summarised in two other ways to help get the points across! Firstly, a fun video by a professor running through these in under 60 seconds as below, or, click here to see him on YouTube. 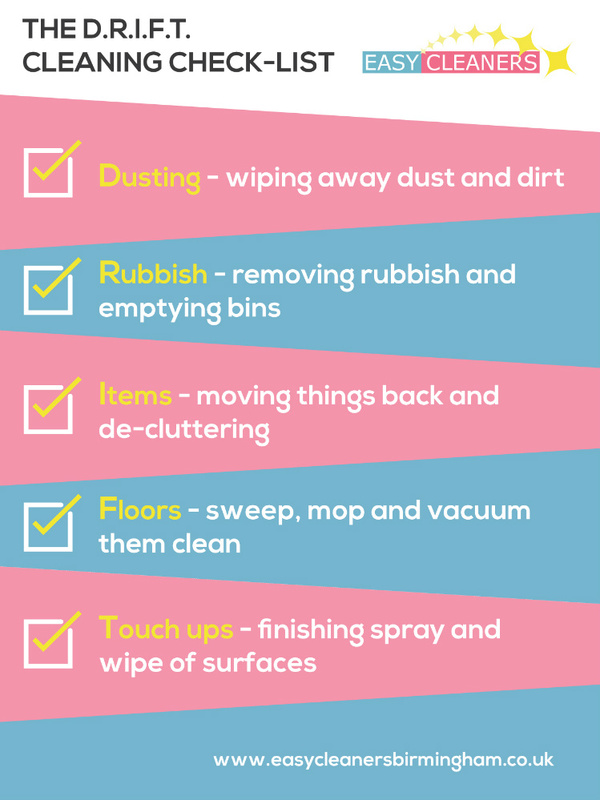 Secondly, a downloadable DRIFT Checklist to visually see our tips and even print off and place on your fridge door as a cool reminder and to pass to others.